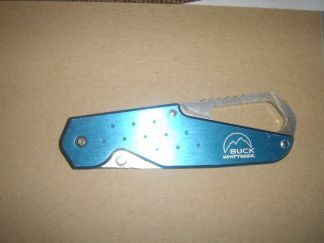 Reviews > Knives > Folding > Buck Knives Approach > Owner Review by Mike Daurio Jr. I am quite new to backpacking. My experience lies mostly as a canoe guide. My inspiration to get more into this sport/hobby was a backpack trip to Thailand in 2005. Due to my experience I am fond of lightweight, waterproof quality gear. I backpack in mainly hilly forested areas and of course near rivers and streams. I also do a lot of backpack traveling to other countries. I am a 3-season backpacker. Every year I spend time in the Ozarks in Missouri and in Voyageurs National Park in Minnesota. I'd love to explore Canyonlands National Park in Utah. 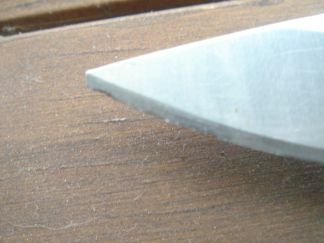 The Approach is a folding knife with a partially serrated blade. It also has a large lanyard loop which makes it easily attached to a tool loop by a carabiner. It has a one hand opening feature. This is done by pushing wth my thumb on a small thumb stud and swinging my thumb half circle in a clockwise motion starting at six o'clock and ending at 12 o'clock. 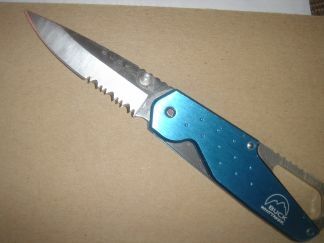 The manufacturer lists the blade steel as 420 HC and the hanldle is anodized aluminum. The Approach has seen many trips, day hikes, and types of terrain. I have used the knife on three trips to the Current River in Missouri. 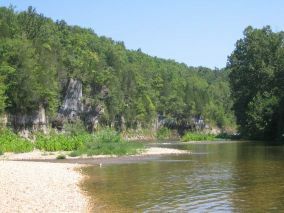 While there, we do many exploring day hikes and also a 20 mi (32 km) section of the Ozark Trail. Terrain consists of limestone bluffs lined in forest and gravel bars with a spring fed river winding through it all. As the river winds through the mountains, its elevations recede from 852 ft (260 m) above sea level down to 570 ft (174 m). When on the trail elevations reached 870 ft (265 m). The trail's terrain was dirt or gravel trail through dense forests primed with hungry deer flies ready to bite and annoy us. This year, temperatures scorched to a recorded 113 degrees F (45 C) dropping to a comfortable 72 degrees F (22 C) at night. 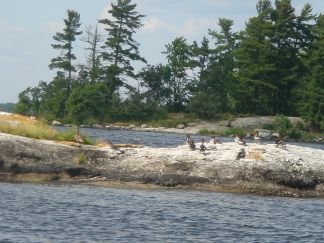 The knife has also seen the back woods of Lake Kabetogama in Minnesota's Voyageurs National Park twice. This trip was spent with my fianc�e's family. We canoed Lake Kabetogama, setting up three different base camps and heading out on numerous day hikes to do some exploring. The terrain consists of rocky shores covered in grass and moss, some sandy beaches, and dense north woods forests containing pines, poplars, and quaking aspen. Elevations stayed pretty constant between 1100 -1200 ft (335-366 m) above sea level. Temperatures were between 85-89 degrees F (29-32 C) during the sunny days, and got down to almost 60 degrees F (16 C) at night. The knife is carried with me on all day hikes and a few shorter trips to places like Kettle Moraine state forest in Wisconsin, Glacial Park Conservation area in Illinois, and other numerous parks, recreation areas, and state forests I've explored in the last two years. I have a multi tool that I keep on my belt daily. The Approach is my field knife. I chose the knife because of the carabiner loop at its base. This allows me to hook it to the D ring loop on my shoulder strap of my pack with a carabiner, for easy access. The knife is used in the field for cutting food like cheese, apples, and sometimes steak. It has been used to clean a pan fish once. I use it to shave off kindling for fires. And I have carved and whittled a few projects on the river. I also use the knife for opening CDs, blister packaging, and cardboard boxes around the house. It gets a tremendous amount of use. The opening of the blade is simple with the one hand opening system. I am right-handed and the knife's one hand system is tough to open with my left hand. The handles are riveted to the frame and the blade is attached with a pin that allows it to swing smoothly in to a locked position. The blade locks firmly in the frame by a tensioned piece of steel. A small amount of pressure by my thumb frees the blade in order to return it to the safe holding compartment. When open, the knife fits nicely in my hand for easy sawing, or shaving. The outside is a blue, anodized aluminum handle that has small divots in it to prevent slipping. The Buck Approach has cut through numerous branches, whittled many sticks, and has cut a fair amount of plastic packaging in its life. I have sharpened it regularly with a simple sharpening stone. I can't seem to get it back to its newly-out-of-box sharpened state. I have also used it to chop a thick branch, approximately 3 in (8 cm) in diameter. I placed the knife in a slanted position on the branch and struck it with a heavy branch. I repeated this until the job was done. It worked quite well to get the job done; however the knife's blade did suffer. The tip of the blade chipped in a few places. The rest of the blade survived. The Approach is a sharp looking knife with convenient features and solid construction. I like the look of the knife overall. The anodized aluminum handle is attractive. The carabiner loop is by far what sets it aside. I love the fact it allows me to keep it in an accessible place. The ease of opening, the sturdy fixture of the blade when locked, and the fit/grip in my hand are all well engineered. I wish I could get the blade back to "like new" sharpness. I also wish the blade didn't chip, yet in fairness, I was performing a task that I would not do daily and not what the knife was engineered for. Read more gear reviews by Mike Daurio Jr.